montage: Official opening party This Friday night! While we have been officially open for a little over 1 week, we would like to extend a special invitation to all of our friends and followers for this Friday afternoon/evening to come along and check out our wonderful space. We will have finger food and refreshing beverages on hand as well as 2 separate door prize raffles filled with Montage handmade goodness. Davina from Fluid Ink Letterpress will have a small tabletop press inked up and ready for action, and you will have an opportunity to experience some hand making of your own by printing your own Montage bookmark! 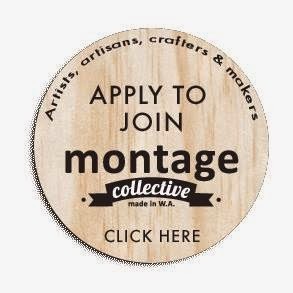 So please come along and meet the Montage artists who will be on hand to answer any questions you may have about their products and processes and join our celebration.